We choose cows that do well on a diet of grass alone. 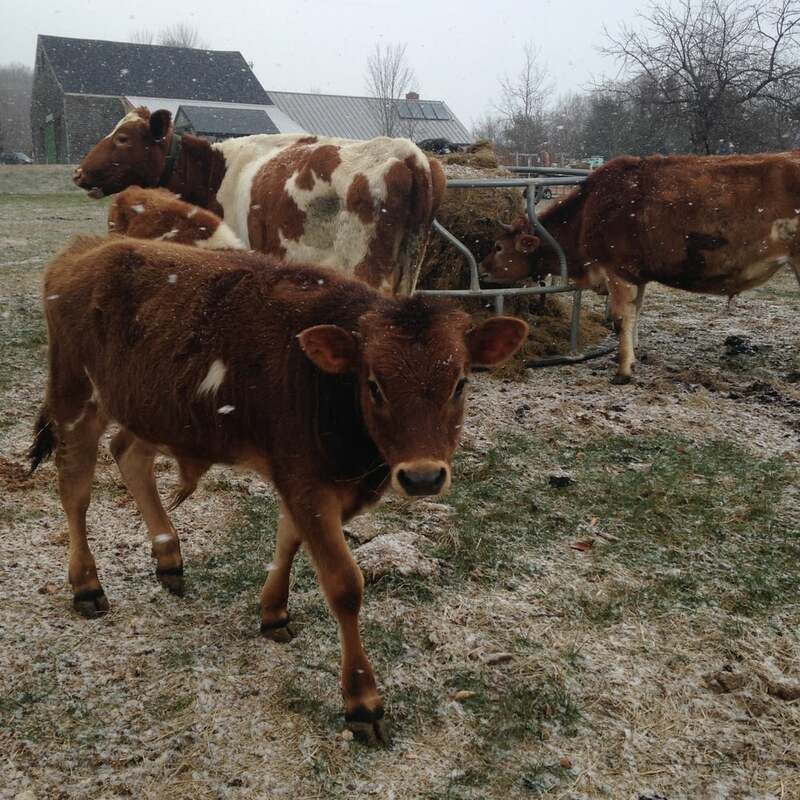 Our cows are on pasture late spring through fall, and eat lush green grass hay through the winter. Our ladies don't give gallons of milk but we are happy to trade volume for quality; their milk is rich, creamy and high in protein. We believe that first and foremost, a cow produces milk to feed her calf. We keep cows and calves together, the calf drinking whenever and however much it needs until a natural weaning time. 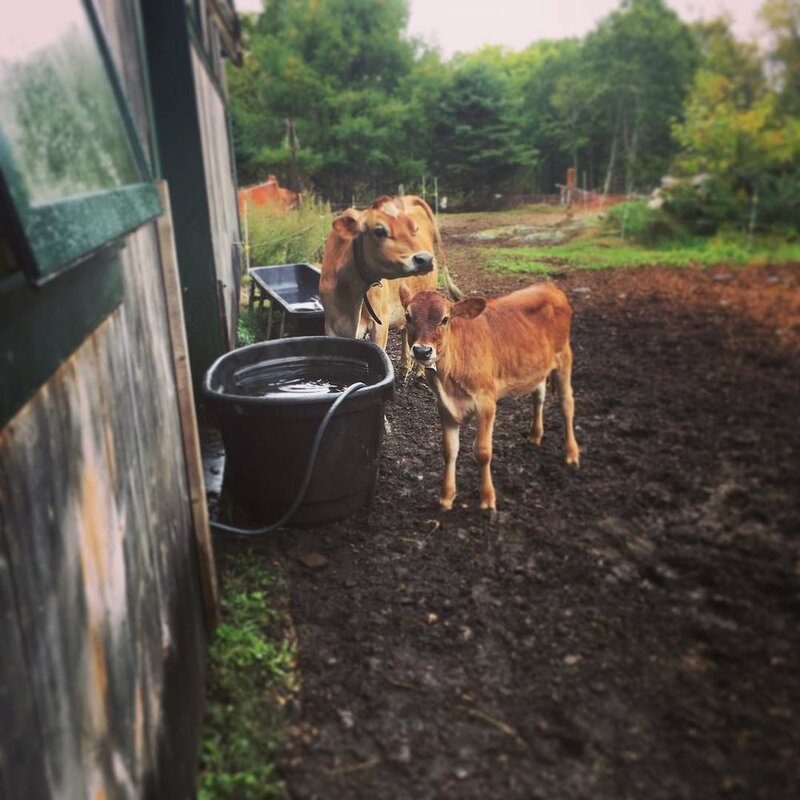 Dairy cows produce far more milk than one or even two calves could drink, so we milk once a day, sharing milk with the calf. Most dairies, even small ones, separate calves from their mothers almost immediately after birth, breaking that crucial bond between mother and offspring. We believe this bond is far more important to the health and wellbeing of our cows than the increase in milk we would gain for production. Caring for cows is a partnership here on our farm, and one of the reasons why we believe our dairy products to be a better choice for you and your family. East Friesians are the highest milk producing dairy sheep. 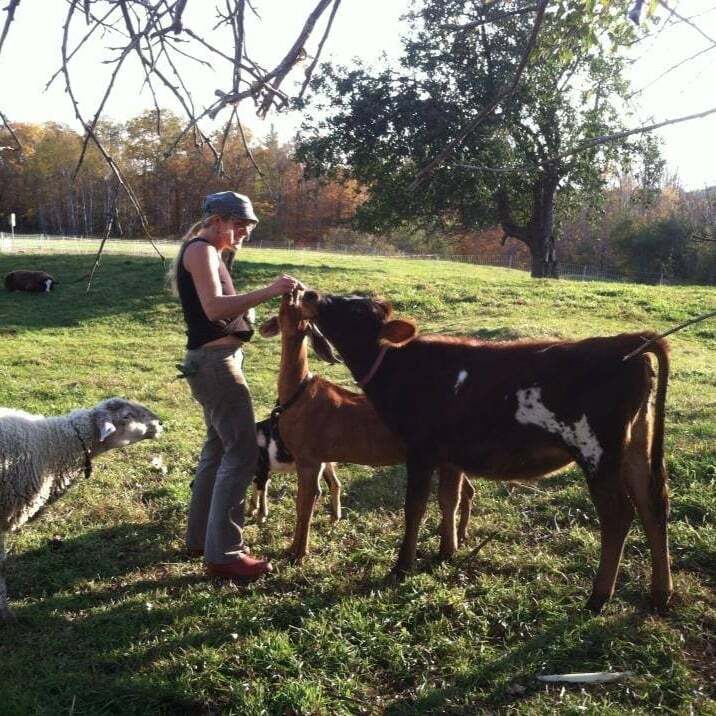 They are a lovely breed, producing incredible milk, delicious healthy meat, and soft wool with a nice luster. 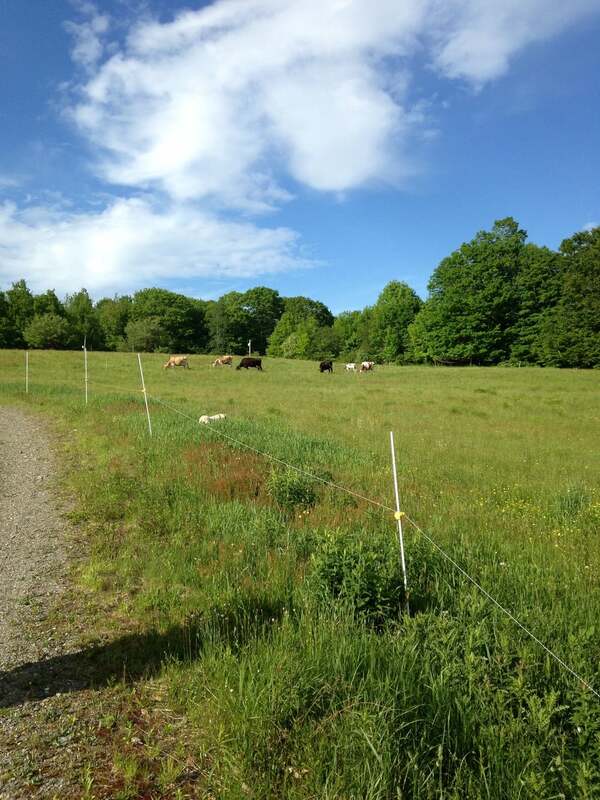 Our sheep are pastured day and night in the summer and eat green grass hay in the winter. We do not routinely use chemical wormers, instead manage parasites with rotational grazing, following sheep with chickens who love to scratch up and eat the worms. As with our cows, we leave lambs with mothers, so that they can bond with each other and so that our lambs grow big and strong alongside the rest of the flock. We take lambs to the butcher early each winter and have a variety of cuts as well as ground lamb and sausages available in our farm store and in the spring / summer at the farmers' market. We started raising Old Spots a few years ago. Old Spots thrive on mixed forage (grasses and woodland) and with enough land require very little grain to fatten. They are docile and charming, and produce the cutest piglets we've ever seen! Our pigs are raised on woodland and pasture. They enjoy a diet of grain, pasture, acorns, apples, whey, milk and sometimes ice cream! We raise heritage and hybrid breed laying hens. 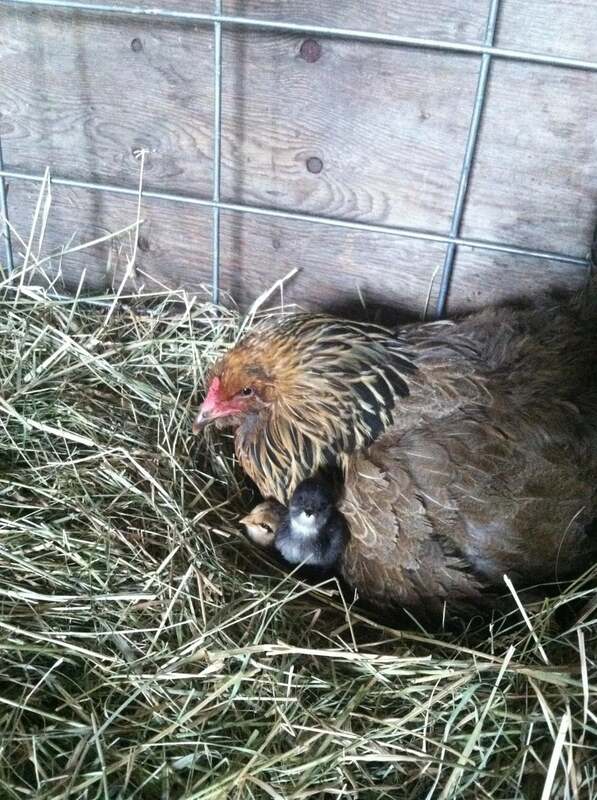 One flock lives in the henhouse and free ranges about the farm yard, providing eggs, entertainment and chicks! The other flock, ranges the pastures, following in rotation behind the cows and sheep, scratching up cow patties, fertilizing, and providing natural fly and parasite control. Their eggs are sold in the farm store. We raise Cornish Rock broilers fed exclusively a diet of Organic grain and cultured milk from our own 100% grass fed cows, pasture grasses and insects. We do not raise our broilers in low roof, confining chicken tractors, but instead allow them to roam free with available shelter from the rain and sun and protection from predators with electric netting. Our broilers are available for sale in our farm store and at the Belfast Farmers' Market. By now everyone has heard of the challenges facing honey bees and other natural pollinators. Colonies of bees are dying off or disappearing at alarming rates. The impacts of this phenomenon are widespread. Despite a lifelong fear of stinging insects, Greg decided to keep bees in order to help increase the honey bee population, assist with pollination on the farm and to harvest honey. 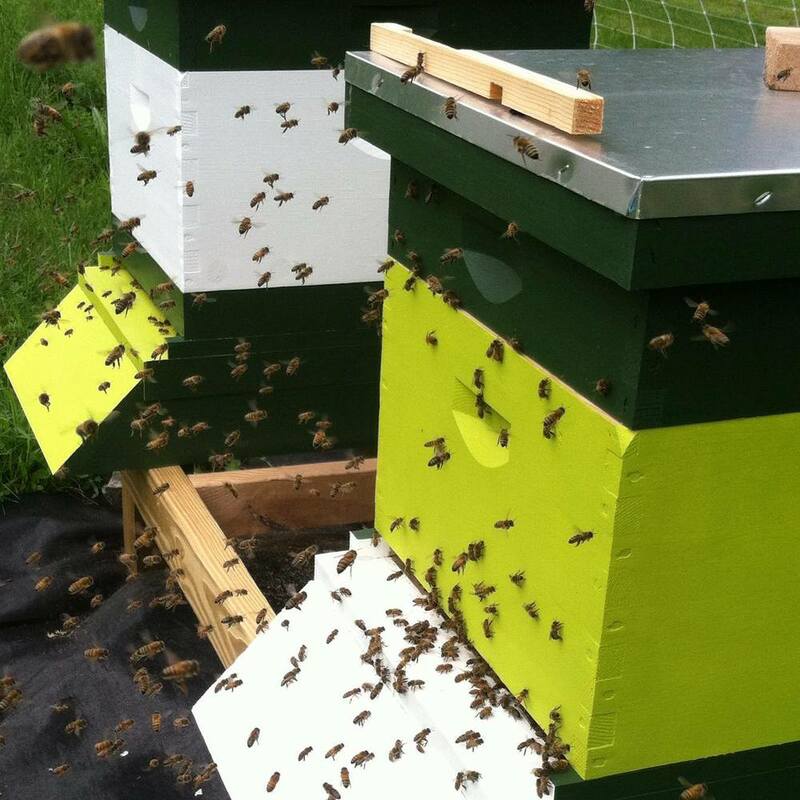 What started as another farm venture quickly became an obsession as many a beekeeper can attest to. Simply put, bees are fascinating creatures from whom we can learn a wealth of knowledge and perhaps even gain some guidance for our own place on the Earth. If you visit the farm in the summer months there is a good chance you will find us out in the apiary enjoying the busy yet calming hum of the bees going about their lives. 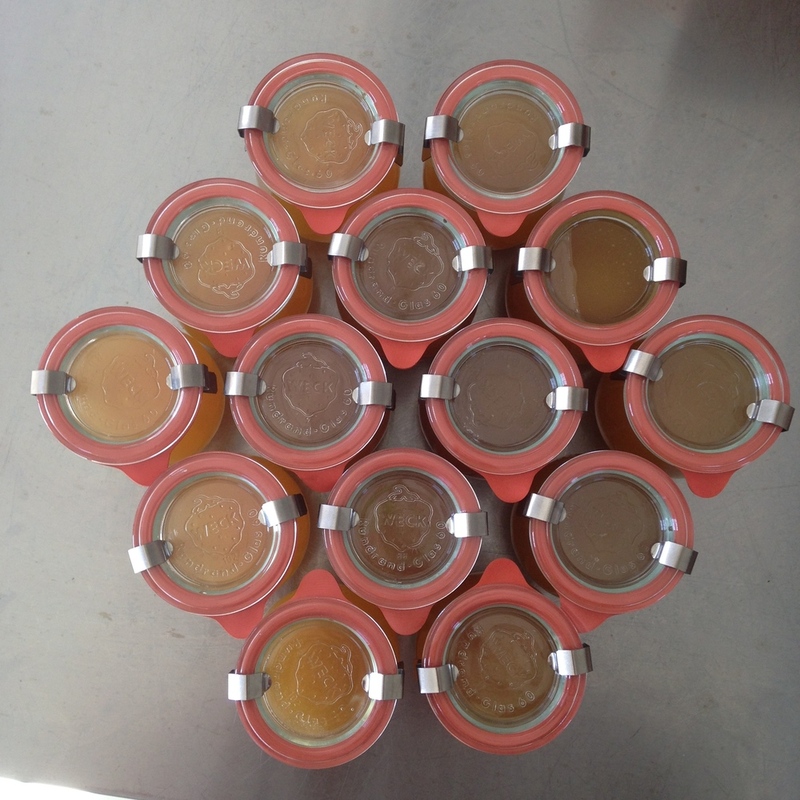 We sell raw honey from our bees in the Toddy Pond Farm store in 12oz, and 25oz Weck Tulip jars.